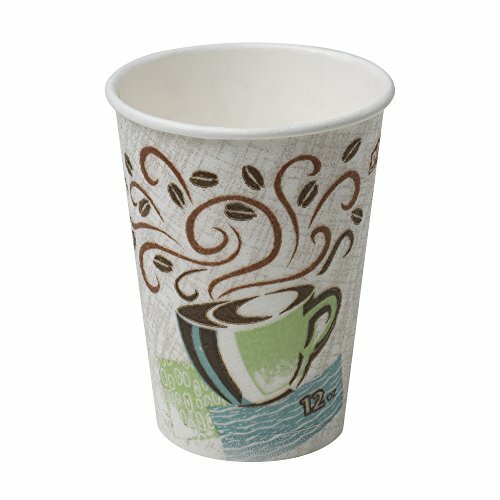 Insulated paper hot cup. The construction of the PerfecTouch cup extends consumption time while adding confidence in overall product quality. Its outer lining keeps hands comfortable to the touch and eliminates the need for double-cupping. Reduces the need for costly double-cupping and sleeves. Comfortable, sturdy, non-slip feel. Patented paper process provides unique insulation. Coffee Design color. 12oz Capacity. Product may be processed in commercial facilities that have final screening capability. Such facilities may not exist in your area. Product contains approx 80% compostable cellulose fiber by weight. Dixie PerfecTouch cups use 25% less material, by weight, than a paper cup and sleeve. *Based on GP limited test data of 12 & 16 oz PerfecTouch cups vs. 12 & 16 oz. Dixie paper hot cups and sleeves from the leading coffee retailer. View More In Household Supplies. If you have any questions about this product by Dixie, contact us by completing and submitting the form below. If you are looking for a specif part number, please include it with your message.